A Sari, also known as Saree or Shari, is a traditional Indian dress that’s been worn by women for many centuries, saree has been the outfit, which makes an Indian woman look and feel complete. It is perhaps the only dress than can be worn in a host of ways. In fact, every Indian state has its own way of draping the saree. Hence, with a single piece of fabric, a woman can create a variety of appearances and feel extraordinary at every occasion. For creating a more wholesome look, a huge variety of this outfit is available for weddings, receptions, parties, and other celebrations of life. It is a piece of fabric measuring anywhere from 2 yards to 9 yards. For holding it in place, a pleat-free petticoat (underskirt) is worn. The saree is then stylishly draped around the waist. A well-fitted blouse graces the upper body, which does not cover the waist. Known as the French Chiffon Saree, it was brought into limelight by Maharani Indira Devi of Cooch Behar. The material is so graceful that it suits women of every age. You will also find the garment made of plain chiffon. The material is comfortable and has a royal look to it. Of course, wearing it, you will also have the rare royal appeal. A plenty of such sarees are available at YOSARI. Net has a sensual aura, as it is partially see-through. Sarees made of net are very popular amongst youngsters. In fact, when a woman wears a garment made of net, she looks several years younger. It is because the fabric highlights the contours of the body perfectly and also allows the lady to flaunt her well-decorated blouse. Take your pick from a string of net sarees available at YOSARI. The popularity of Banarasi silk sarees is due to its classy appearance. Ideal for wearing at important functions and traditional ceremonies, the outfit surely makes the woman feel special. Get yourself such an impressive garment from the splendid range at YOSARI. Who doesn’t like the soft touch of satin? When you wear sarees made of satin, you are bound to attract attention. Moreover, the fabric is easy to maintain, which is an advantage for new wearers. At YOSARI, you will find a good variety of satin sarees. High on comfort and perfect for all seasons, cotton sarees are every woman’s ideal garment. The prints on the cotton have unmatched richness and look gorgeous. Moreover, as cotton is well known for its fast colors, you can rest assured that your garment would retain its fantastic appeal even after several washes. Here, at YOSARI, you will find a vast collection of cotton sarees for all occasions. Apart from the abovementioned fabrics, this traditional Indian dress is available in Brocade, Velvet, Tussar Silk, Crepe, etc. YOSARI’s collection is huge, as it is stacked with wedding sarees, party wear sarees, Bollywood sarees, bridal sarees, designer sarees, casual sarees as well as lehenga style sarees. The most prominent feature of the outfit is there colors. Some have coordinated shades while others show a fine play of contrasting colors. You will also find a large number of them sporting gorgeous borders with heavy embroidery work. These garments look especially good when you are to attend a conventional ceremony. A blouse pays as important role as the saree. You need not look elsewhere for gorgeous as well simple blouses, as YOSARI has a beautiful collection. Out of the available range, velvet blouses are most popular, as they have elegance and the colors are always deep and vivid. Can saree be a good bridal wear? Undoubtedly, the answer is YES. 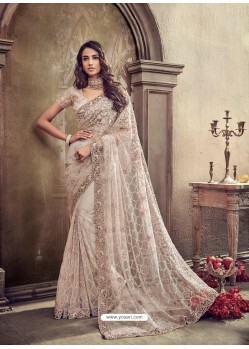 Most would-be brides go for lehenga sarees or the designer ones for their wedding day. Actually, the garment is so feminine that it attracts the most attention making the bride feel extra special. For this reason only, many women choose to wear this outfit for all the minor Indian wedding ceremonies that lead to the wedding day. Here, at YOSARI, the enormous array of sarees will surely take your breath away. With exclusive designs and shades, you will be able to select many for the most special ceremony of your life. What is the best online destination for purchasing designer sarees? A designer saree is unique in every way. Designers put in a lot of effort in creating designs on paper and then they are printed or embroidered on the fabric. All the materials that are used for making designer wear is exclusive as it is not used in the same way on any other garment. Therefore, designer sarees are perfect for you when you just wish to look different from others. Some of the most popular materials used for making the designer attire are zari, gota, sequins, pearls, and semi-precious stones. The designer wear is a great option when you wish to experiment. For instance, many women choose to wear the saree over pants. You too could create your own distinct look by choosing one of the sarees available at www.yosari.com. Start shopping now!